This is the third post in a series on copyright in medicine. We started off the series with two posts. The first discussed the importance of a NEJM article advocating for the greater use of copyleft licenses in medicine. The second detailed the dubious copyright infringement claims by the authors and owners of the mini-mental state exam. This last post in the series is a call for help maintain a bare minimum of open access to taxpayer funded research. A new Association of American Publishers (AAP) backed bill titled the “Research Works Act” is threatening the currnet National Institutes of Health (NIH) public access policy. The current NIH policy requires that all final peer-reviewed journal manuscripts that arise from NIH funds be submitted to PubMed Central upon acceptance for publication, and that these papers are accessible to the public on PubMed Central no later than 12 months after publication. 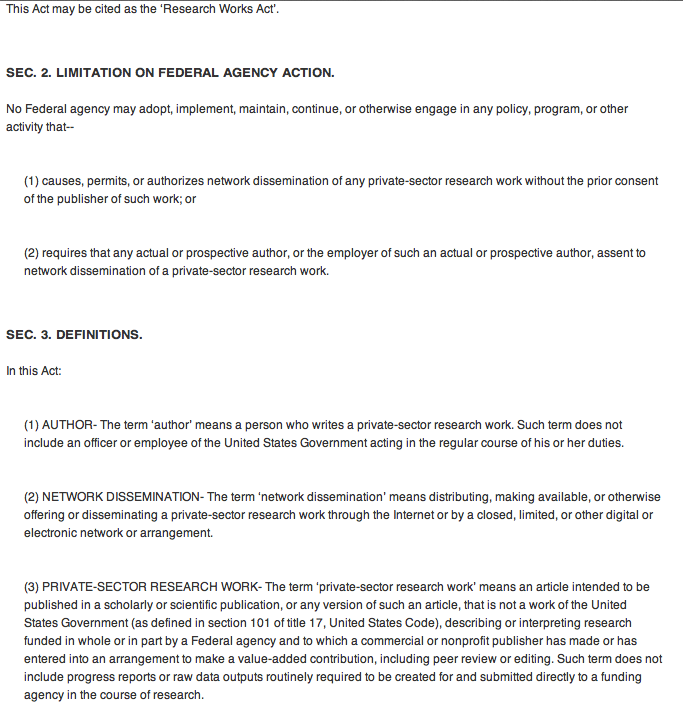 (2) requires that any actual or prospective author, or the employer of such an actual or prospective author, assent to network dissemination of a private-sector research work (i.e any non-governmental agency like a university). “call/write/email/tweet Representative Maloney today, and tell her you support taxpayer access to biomedical research results. Ask her why she wants cancer patients to pay Elsevier $25 to access articles they’ve already paid for. And demand that she withdraw H.R. 3699." By far the easiest thing anyone reading this post can do is to start off by tweeting Rep Maloney at either @RepMaloney or @CarolynBMaloney. I would also strongly encourage you to tweet Rep Issa at @darrellissa, as he proudly proclaims himself to be for "an #OPEN, accessible & uncensored internet" (makes you wonder why he proposes cutting off open access to journal articles). I probably wouldn't go as far as Deevy Bishop and I don't think it is fair to single out Elsevier, but it does make me think of all the free labor that I willing give to these journals. A similar option is to take a "don't peer-review articles from non-open access journals" approach as seen in this letter by Michael Ashburner posted on Casey Bergman’s blog. Lastly, you can make your voice heard also to the the National Science and Technology Council's Task Force on Public Access to Scholarly Publications. There is a Request for Information (RFI) on the Federal Register's website that closes on January 12 (ignore the date on the website, the deadline was extended). This is not part of the bill, but it is another way to get your voice heard. Addendum: for an excellent round-up of blog posts on this subject go to John Dupuis' blog. Certainly, research funded by public funds should be freely available to the public. However, the fact is that medical publishing today is a hugely profitable enterprise run by greedy business people and not by professionals interested in advancing scientific discovery or public health. What other business obtains its raw materials at no cost (medical articles, in this case), has a large cadre of unpaid, slave labor at its command (eg, peer reviewers) and then charges the public outlandish fees for the finished product (eg, in some cases >$50 USD for an individual article of from 1 to 15 electronic pages)? And, with so many competing enterprises of this nature, is it any wonder that medical journals are filled with studies of dubious quality and little validity; eg, underpowered trials with diminutive but statistically significant effect sizes? In my opinion -- as a researcher/writer -- 90% of what is published in the medical literature these days is overly biased and cannot be trusted as valid. The editors should hang their heads in shame and the public (professionals and all other consumers of the literature) should make their displeasure known by not scribing to or purchasing such drivel.